The seasonal global land and ocean temperature were the fourth warmest for September–November since records began in 1880. For land temperatures only, the three month period was the fifth warmest for the season. The ocean surface temperature was the fourth warmest on record. According to NOAA’s Climate Prediction Center, La Niña conditions, which prevailed at the end of November, are expected to persist through the Northern Hemisphere winter. Two catastrophic hurricanes affected mainland United States and Puerto Rico during the fall of 2017: Hurricanes Irma and Maria. Hurricane Irma passed over parts of the U.S. and British Virgin islands as a Category 5 storm on September 6th where complete devastation was reported. Irma next hit northern Cuba, weakening slightly while heading toward the Florida Keys before making landfall on Cudjoe Key, Florida with Category 4 winds of 130 mph. The Florida Keys were heavily impacted, with 25% of all buildings destroyed. Irma made another landfall on Marco Island, Florida as a Category 3 storm. Later that same month, Category 5 Hurricane Maria, the strongest tropical cyclone of the year, made landfall on the island of Dominica on September 18th, causing catastrophic damage and 3 dozen deaths. Maria next made landfall on the island of Puerto Rico as a Category 4 storm on September 20th, devastating transportation, agriculture, communication and energy infrastructure. The Federal Emergency Management Agency (FEMA) reports that federal assistance to Puerto Rico has topped $1 billion. Recovery efforts are still underway. Not surprisingly, overall cyclone activity in the Atlantic basin in 2017 was well above average, with 17 named storms, 10 hurricanes, and 6 major Hurricanes. In terms of Accumulated Cyclone Energy, or ‘ACE’ which measures the combined strength and duration of tropical cyclones, the 2017 season is coming in as the most active since 2005. 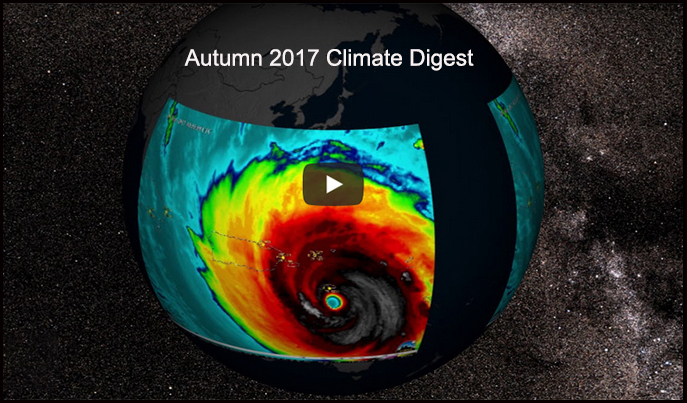 The quarterly climate digest, produced seasonally, consists of a short movie (4:15 minutes) made for SOS and an MP4 video accessible through YouTube.